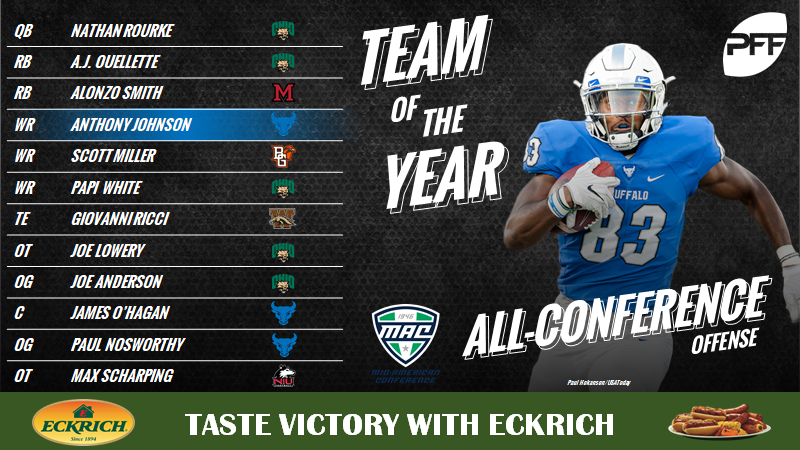 The All-MAC selections below are headlined by the first team with the second team listed below each position. Rourke led the conference in overall grade at the position by over 10.0 points as he was a true threat with both his arm and his legs. Forcing a conference-best 39 missed tackles on carries, Ouellette bruised his way to a healthy average of 6.2 yards per carry and 3.67 yards after contact per attempt in 2018. Smith recorded 35 combined first-down and touchdown runs in 2018 while his 4.03 average yards after contact per carry ranked him second in the MAC. Johnson may hear his name called early in the 2019 NFL Draft after he put up another monster year for the Bulls. He averaged 5.1 yards after the catch per reception and forced 12 missed tackles, proving he’s not just a contested-catch receiver and can do it all. Miller was the conference’s most targeted receiver, seeing 107 passes come his way. He turned those into a conference-best 1,137 yards and 41 first-down receptions. A true threat with the ball in his hands, White gained 350 yards after the catch this season and forced eight missed tackles. Only four MAC tight ends saw more than 20 targeted passes and Ricci led them all in every major statistical category as well as overall grade. A Second-Team All-American, Lowery was impressive this season for the Bobcats. He allowed just nine pressures on 334 pass-blocking snaps while his 85.3 run-blocking grade was 7.2 points higher than the next closest tackle. A fellow standout on the Ohio offensive line, Anderson allowed just eight pressures on 348 snaps in pass protection. An honorable mention on our All-American team, O’Hagan anchored a Buffalo offensive line all season long as he allowed just four pressures on a whopping 446 pass-blocking snaps. The MAC’s most impressive run-blocking guard, Nosworthy’s 75.7 grade was nearly 5.0 points higher than the next closest guard. A year after setting the PFF College record for pressures in a season, the secret was out on Smith as he was regularly schemed against and double-teamed in 2018. He still recorded 63 total pressures that included a national-best 15 sacks and 11 QB hits as well as 37 additional hurries. Howard was the most dominant interior force in the MAC this season, leading the way with 33 defensive stops and seven sacks. A fixture on the MAC Teams of the Week, Costin regularly dominated games and finished with the conference lead in total QB pressures (32) among his position. 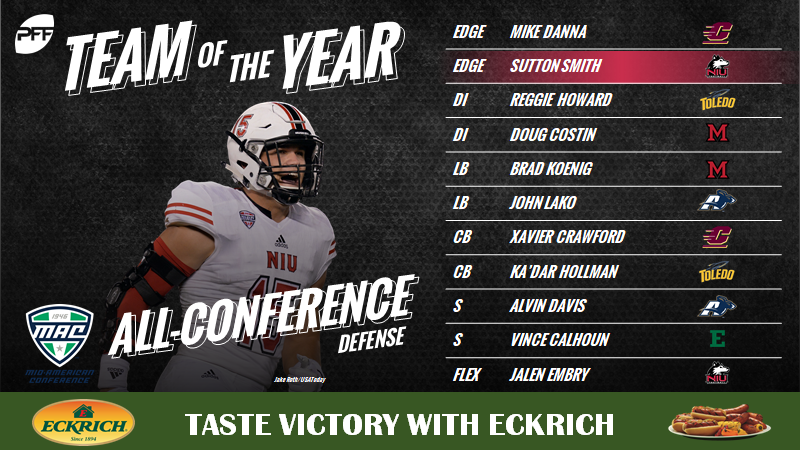 A Second-Team All-American at our Flex Defense spot, Koenig played Miami’s hybrid-type linebacker position admirably, recording 22 QB pressures on just 67 blitzes and three interceptions on 28 targeted passes in coverage. Lako was an Honorable Mention on our All-American team, finishing the season with the sixth-highest grade in the nation at linebacker. Transferring from Oregon State, Crawford had a career year with the Chippewas, recording a career-best in catch rate allowed (41.0%) and passer rating when targeted (56.6). Hollman was targeted a whopping 68 times in coverage this season, yet he allowed just 32 receptions and only 136 yards after the catch. Davis allowed just 12 receptions in coverage while he racked up half as many plays on the ball himself with four interceptions and two more pass breakups. Calhoun’s 37.8 passer rating when targeted was the best among MAC safeties who were targeted at least 23 times in coverage. Embry finished tied for fourth in the MAC with seven pass breakups while he limited receivers to the third-lowest catch percentage among qualified cornerbacks. Hagee was a perfect 35-of-35 on extra points this season while he drilled his lone field goal attempt from 50-plus yards as well. Ference averaged the conference’s second-highest hangtime at 3.92 seconds, giving his coverage team the chance to limit returners to just 5.4 yards per return that was the best among MAC punters with at least 12 punts returned. Johnson was the conference’s highest-graded kick returner, averaging 25.7 yards per return, forcing multiple missed tackles. The true freshman stood out this season, not only on the receiving side of things. He averaged 18.2 yards per punt return and secured all punt return attempts without a single muff punt.